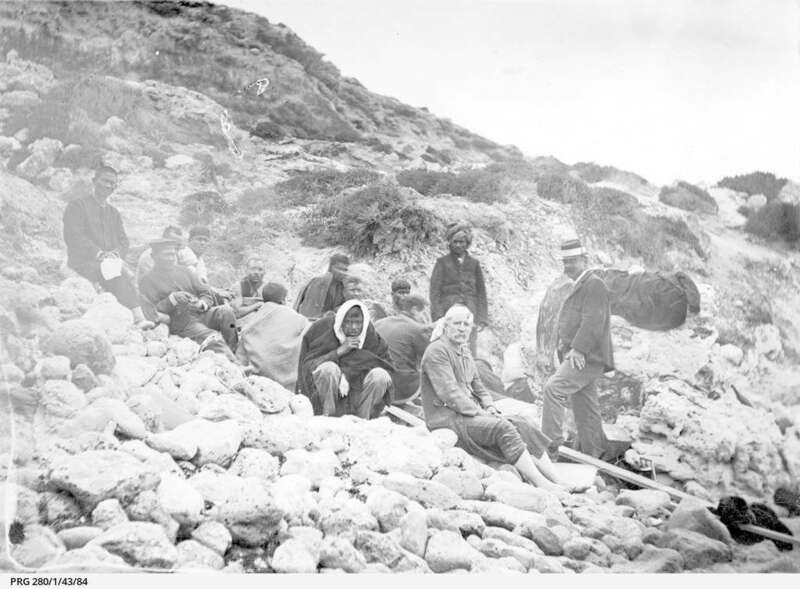 Shocked survivors from the wrecked ship Clan Ranald sitting amongst rocks at Troubridge Hill on the Yorke Peninsula, South Australia, 1909. Some are wrapped in blankets and a policeman stands with them. Courtesy State Library of South Australia PRG 280/1/43/84. October 8, 2018 marked the 60th anniversary of the abolition of the controversial dictation test, which was a central feature of the Immigration Restriction Act 1901. This was one of three pieces of legislation, together with the Pacific Island Labourers Act and the Post and Telegraph Act, which were passed after Federation in 1901 and colloquially known as the White Australia policy. Together these acts placed restrictions on immigration and sought to remove prohibited immigrants, namely those from Asia and the Pacific Islands, from the new Commonwealth. The Immigration Restriction Act was replaced by the Migration Act 1958, which introduced a simpler system of entry permits. The dictation test required non-European immigrants to write out a passage of 50 words in any European language (later any prescribed language) as dictated by the immigration officer. Since the choice of language was at the discretion of the officer, undesirable immigrants were destined to fail the test. They could then be declared prohibited immigrants and deported. One of the most infamous cases of the application of the dictation test dates to 1909 and involved the Scottish cargo ship SS Clan Ranald, its Asian and Indian crew (known as lascars), and one of South Australia’s worst maritime disasters. Port side of Scottish cargo ship SS Clan Ranald. ANMM Collection Gift from the Estate of John Watt ANMS0419. SS Clan Ranald was a two-deck turret ship built in 1900 by William Doxford & Sons in Sunderland, England, for the Clan Line of Glasgow. On the morning of 31 January 1909, Clan Ranald embarked from Port Adelaide with a cargo of wheat and flour bound for South Africa. The ship had been permitted to depart despite a four-degree list to starboard, likely to have been caused by the 170 tons of coal loaded on its top deck. On board were 10 officers and 54 crew, the latter of Asian or Indian origin. At 1400 hours, in deteriorating weather off the southern Yorke Peninsula, Clan Ranald lurched onto its starboard side at a 45-degree angle. It is thought that the ship’s cargo shifted and caused it to become unstable. As darkness fell, the crew desperately tried to signal the shore and nearby vessels for assistance, but at around 2200 hours, Clan Ranald capsized and sank off Troubridge Hill, south of Edithburgh. Forty of the 64 crew members died in the disaster, making it one of the worst shipwrecks in South Australia’s history. 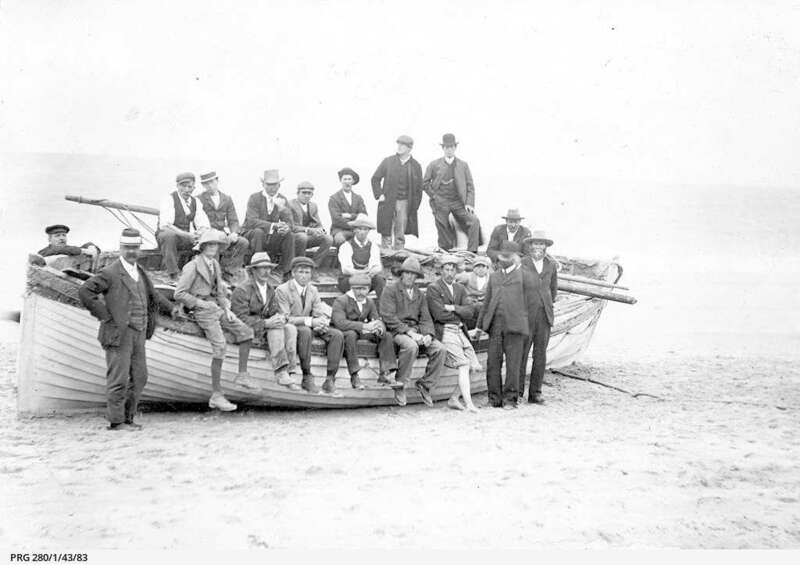 Men and boys who were part of the rescue party for survivors of the wrecked steamer Clan Ranald standing with their lifeboat at Troubridge Hill beach near Edithburgh, South Australia, 1909. Courtesy State Library of South Australia PRG 280/1/43/83. On 1 February 1909 Clan Ranald’s 24 survivors, battered and bleeding, were transferred to the town of Edithburgh and then taken to Port Adelaide. The four British officers were accommodated at the Royal Arms Hotel, while the 20 lascar seamen were detained in the basement of the Prince Alfred Sailors Home. Members of the local community had been involved in the rescue and supported the men by providing money and tobacco. But under the terms of the White Australia policy, the lascars were hand printed and given a dictation test in English. 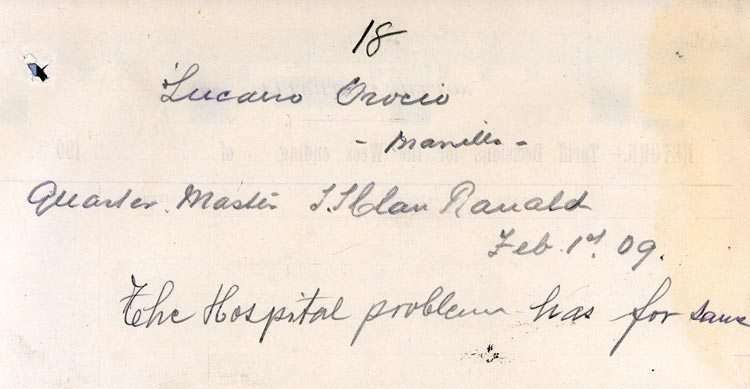 First dictation test answers for Clan Ranald‘s Filipino quartermaster Lucano Orocio, 1909. Courtesy National Archives of Australia D596, 1909/687. Nineteen of the colored crew failed to pass the test although some of the men spoke good English. The quartermaster (Lucano Orico) [sic] known as No. 18 on examination showed that he not only could read and speak English fluently but could also write the dictation test without any hesitation. Consequently the test must be put in another language than English and one with which he is unacquainted. Lucano Orocio of Manila duly failed the second dictation test. 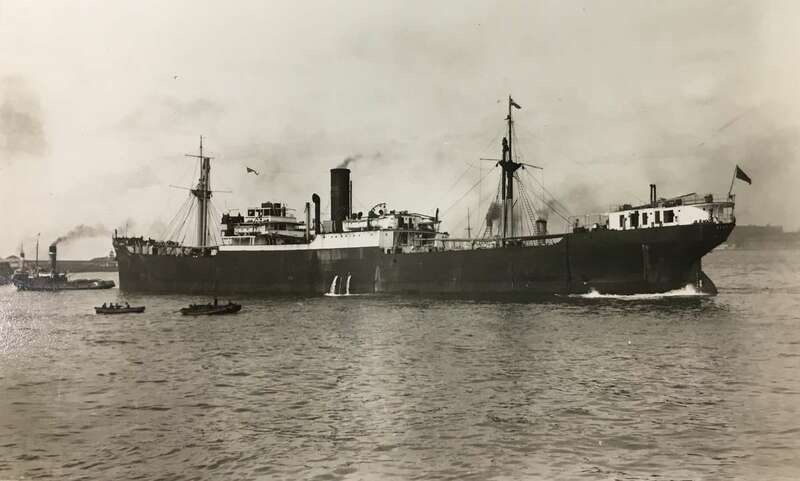 The 20 lascar seamen were deemed illegal immigrants and sent to Melbourne to be deported to Colombo on SS Clan McLachlan. Public outcry over their inhumane treatment would eventually force the Commonwealth government to amend its legislation to allow shipwrecked people to land in Australia without restriction. Rescuers later recovered the bodies of 36 of the 40 Clan Ranald victims. The five British officers were buried in the main section of the Edithburgh Cemetery, while the 31 lascar crew members were interred in a mass grave at the rear of the cemetery. They were identified only by a small plaque to ‘31 Asiatic seamen – names unknown’, even though all of their names had been recorded by immigration officials. Plaque marking the Clan Ranald communal grave, 2011. Photograph by denisbin/Flickr. 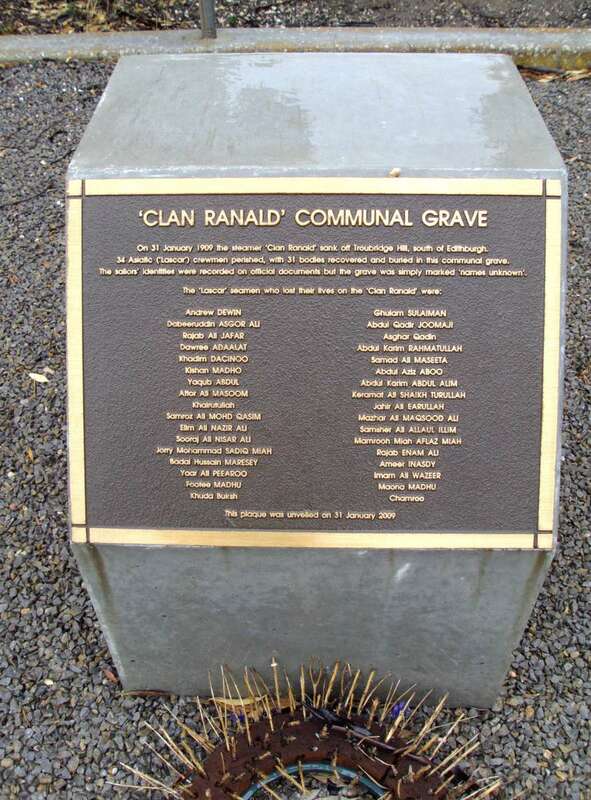 On 31 January 2009, on the centenary of the Clan Ranald tragedy, a new plaque was unveiled at Edithburgh Cemetery naming all of the individual lascar seamen buried in the communal grave. It stands as a tangible, quietly powerful reminder of the workings of the White Australia policy, the intersection of immigration and maritime history, and the impacts of government legislation on human lives.